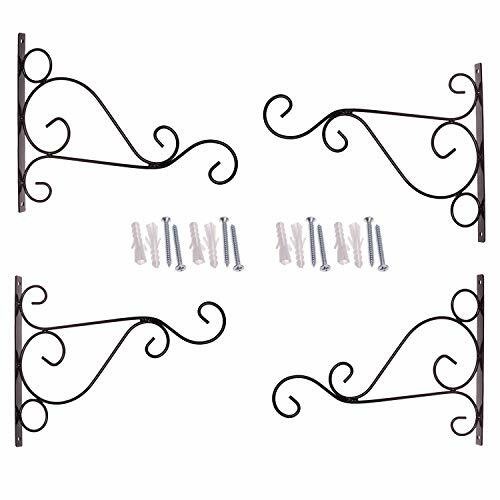 Quality:Hand welded wrought iron offers a charming, traditional look. Install--- Bracket is convenient for installing, can be mounted on walls or columns for indoor and outdoor usage,There are two hooks for hanging plants. Ornate With a Refined Look:A dark finish stunningly complements anything that hangs from Hanging Plants Bracket, adding elegance and beauty to your home or garden.Matching screws maintain a consistent, sleek look. MATERIAL--- Metal plant bracket be made of rust resistant, heavy duty steel construction. Sturdy construction for hanging plant baskets.Bring your heaviest pots and baskets. MULTI-PURPOSE--- You can mount Plant Hanging Brackets on wall, deck, fence, door for indoor or outdoor events in living room, garden, garage or balcony. Simple design with primitive swirls and clean finish, complements the hanging ornaments and adds color to the occasions. Versatile wall mounted hook---Beautify your home or garden by hanging bird feeders, lanterns, planters, flower pots, holiday decorations, string lights, wind chimes, ornaments, candle holders, path lights, and so on! CLASSIC DESIGN---The hand forged Bracket with speacial design add a vintage flavor to your home or garden. If you have any questions about this product by Orgrimmar, contact us by completing and submitting the form below. If you are looking for a specif part number, please include it with your message.